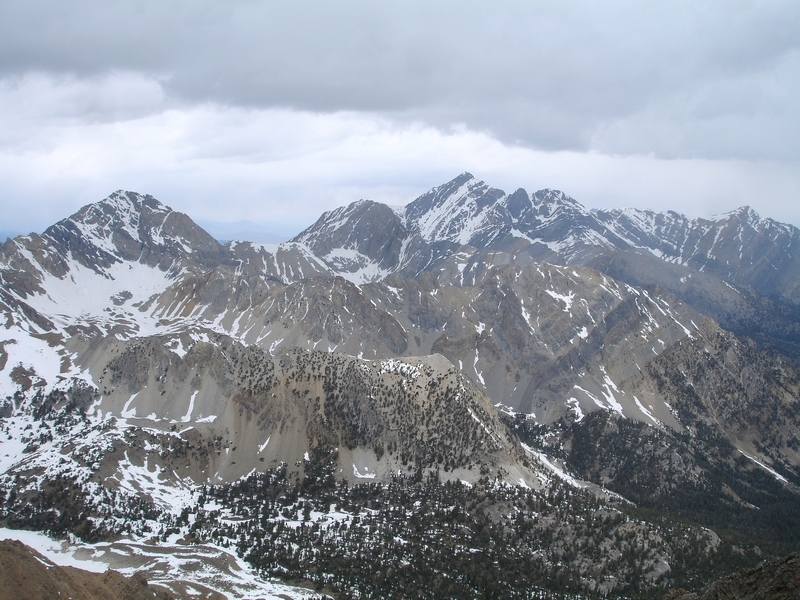 Leatherman Peak is the second highest mountain in Idaho and one of the more distinctive peaks in the Lost River Range. 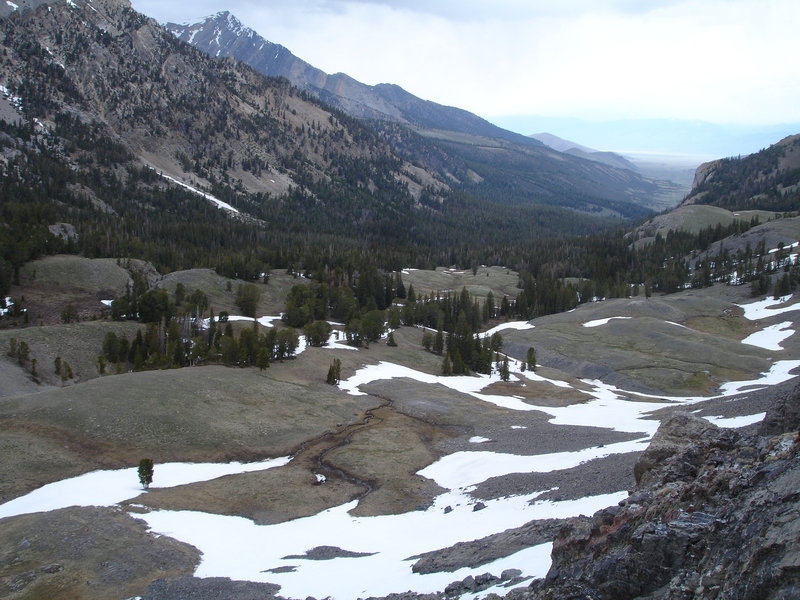 It’s pretty easy to spot from the highway, just to the right (east) of Leatherman Pass, which the lowest point on the main Lost River Range crest. 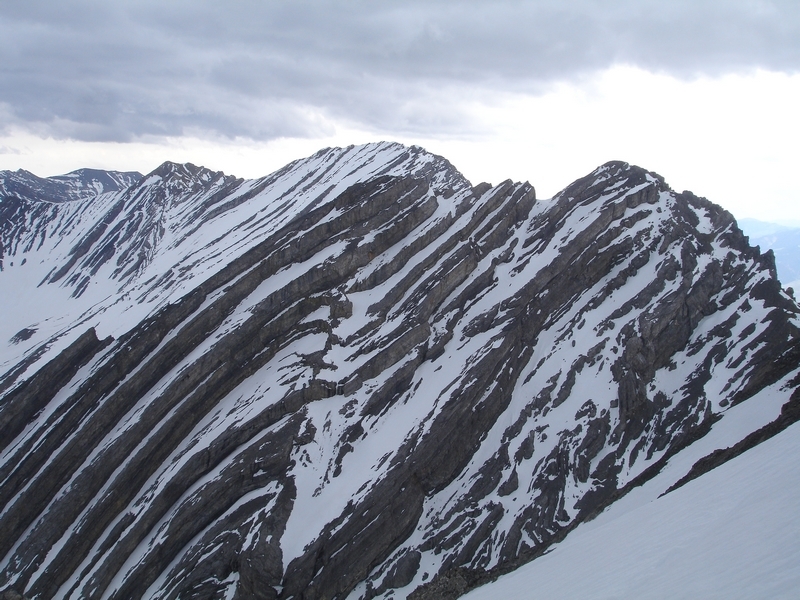 Leatherman in most often climbed from the Pahsimeroi Valley north of the peak. 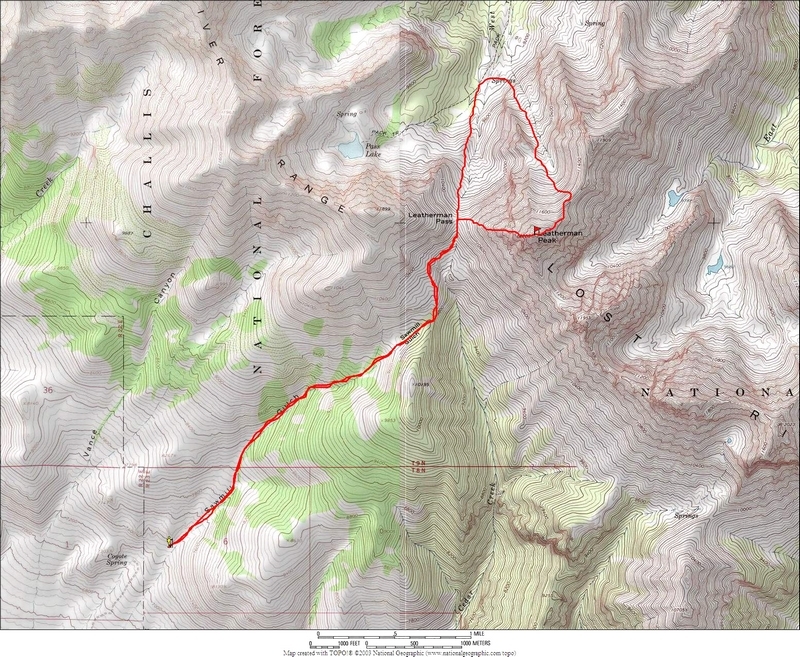 That route is less difficult and is 1000 feet less of vertical climbing, but it’s a long drive on very rough roads. 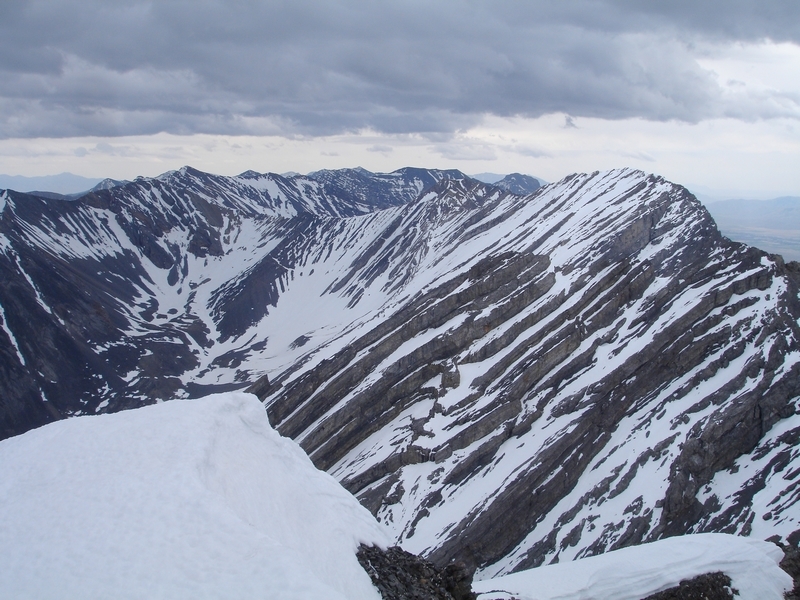 We didn't go with that option due to time constraints, and took the southern route up Sawmill Gulch then climbed the west ridge of the peak from Leatherman Pass. The trip came together on short notice. Sean D had planned to do a climb in the Lost Rivers, but his original partner had to cancel so he invited me along. Neither of us had been on Leatherman before, so plans were set. We were able to get out of Boise by around 4:30am for an early departure. It was the first time Sean and I had met and we spent the drive getting acquainted and talking about stuff like hikes, peaks, and the virtues of Boise County vehicles (where Sean lives and where I grew up). Making our way up Highway 93 along the base of the Lost River Range, we could see the results of a very lean snow year with minimal coverage left on the mountains. We turned up Sawmill Gulch and stopped at a wide spot in the road below a wash at around 7300’ per the GPS. As we started hiking up the road, it turned out the wash wasn’t too bad and we could have probably driven about another mile and a half. Oh well. The road gained elevation pretty quickly as it made its way out of the sagebrush and up into the evergreens. I did my best to maintain a good pace to keep from slowing down Sean who usually likes to trail run his approaches, but I’m sure he could have covered the ground at least twice as fast without me. After a while the road petered out and we bushwhacked for a while before meeting up with the climbers trail. The trail passes through some nice forest that later opens up into a very nice basin in Sawmill Pass at around 9800’. 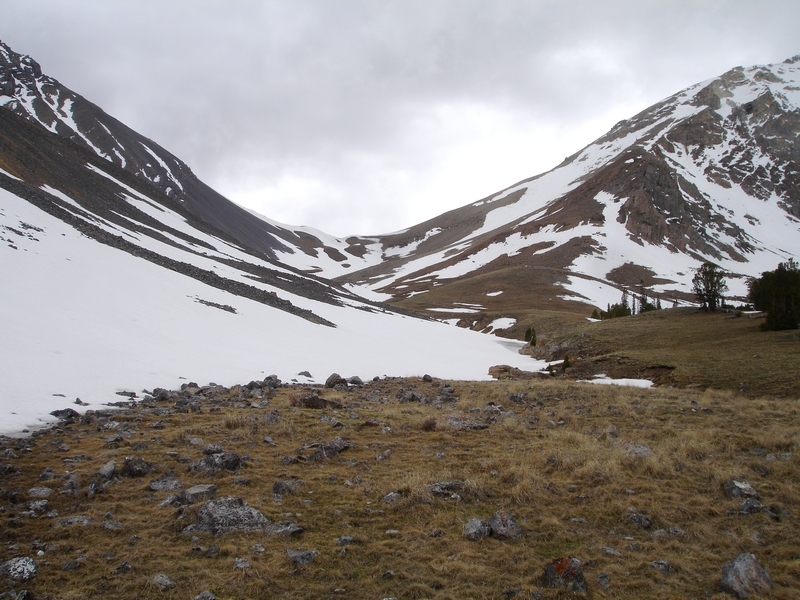 Soon after this lower pass, the trail leaves the trees behind and leads up to the much more prominent Leatherman Pass at 10500’. We got there just in time for some howling winds and a view of ominous clouds coming in from the southwest. From here, the 1700’ of scrambling began. 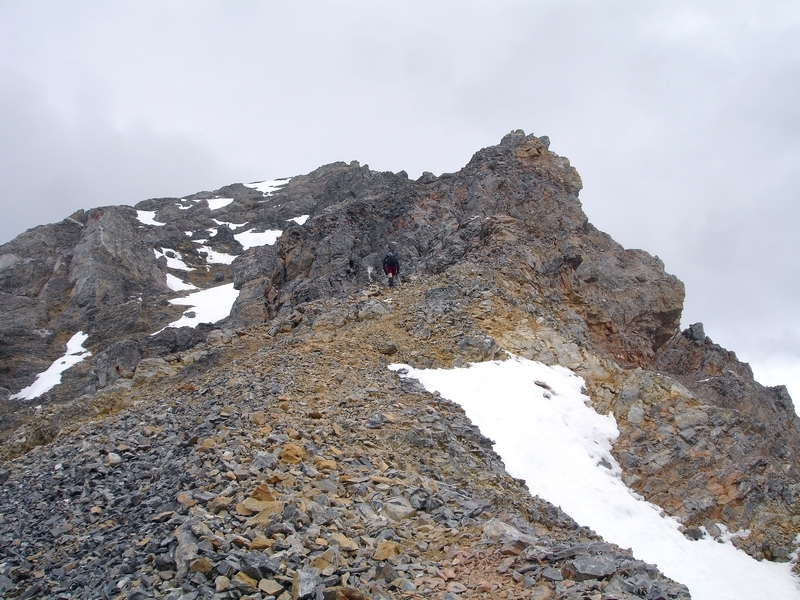 The first couple hundred feet was on loose scree, but there were no real obstacles. Then some blocky towers come into play. The south face of Leatherman is very steep, so we tried to the stay on the ridge as much as possible, with occasional detours down off the north side of the ridge a couple times. 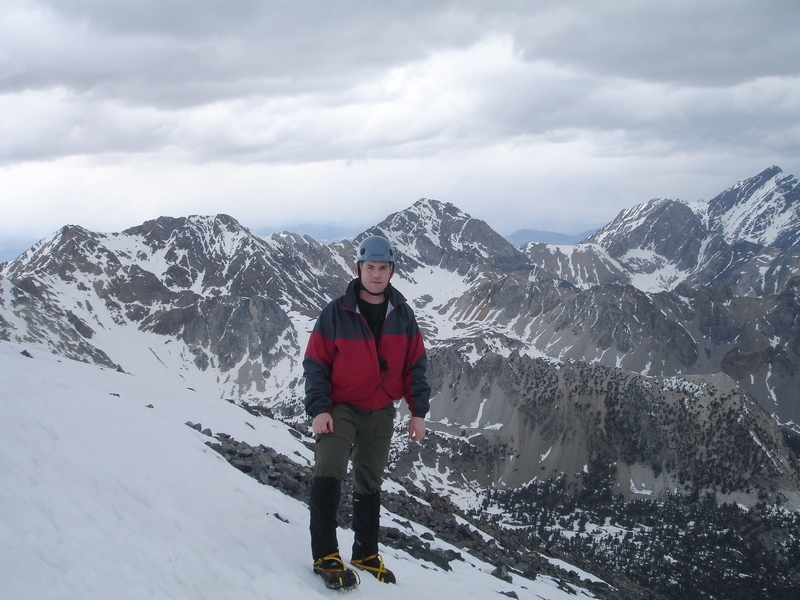 We put on crampons for the occasional snowfields. But the snow was very soft in places and icy in others, so it made for some interesting route finding with a couple low Class 4 moves here and there. 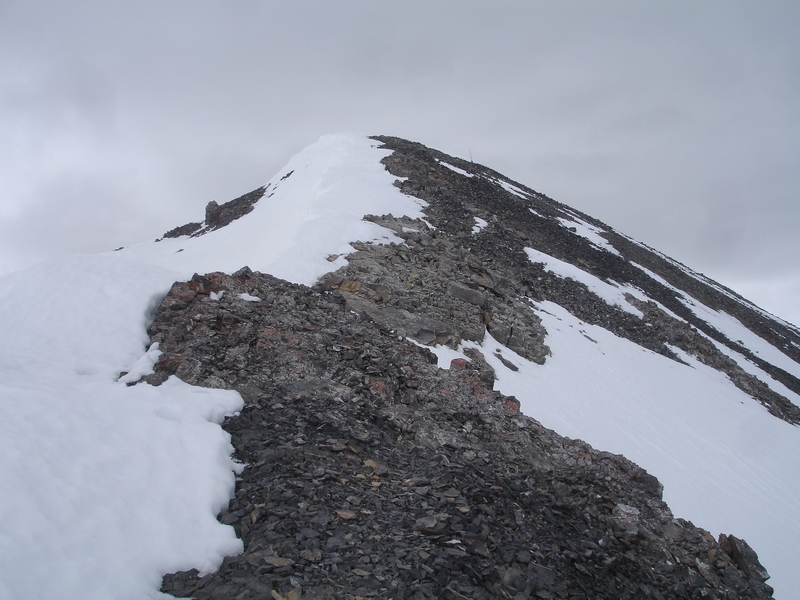 Fortunately the big weather never got to us, and we reached the snow-capped summit with only occasional wind gusts to deal with. 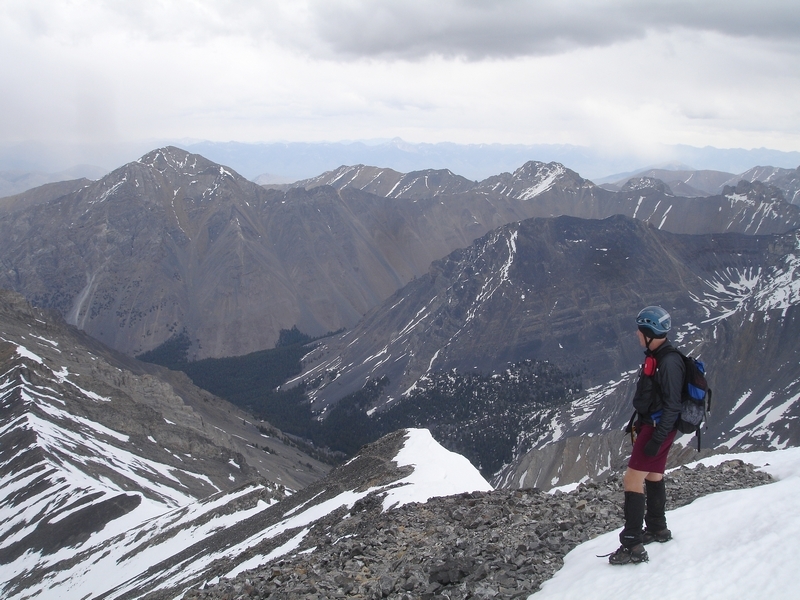 Once on the summit, we enjoyed the views of huge peaks in all directions. Borah was looking good, but I think the most impressive view was of the rock layers on Badrock Peak just to the east of Leatherman. We could also see the gentler northeast gully below us. 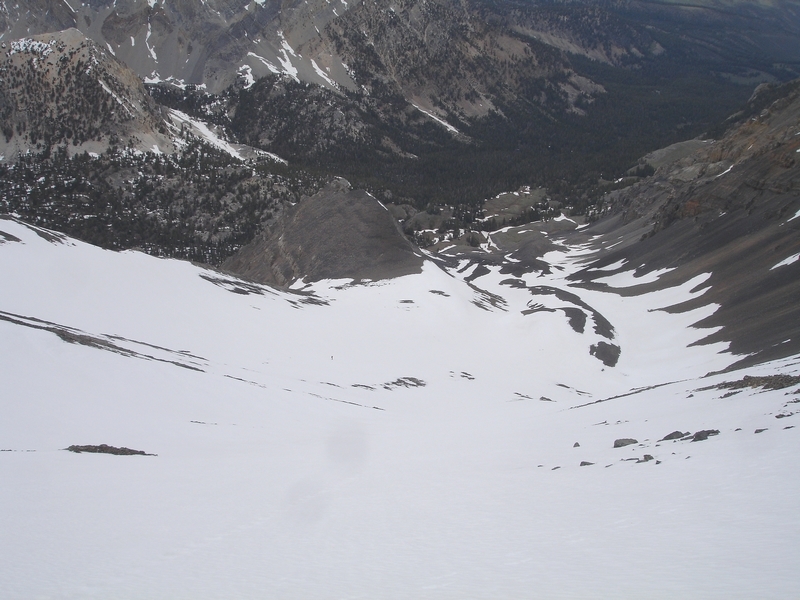 We decided that it might be a good idea to use this easier route to descend in order to bypass the sketchy conditions on the west ride and be less exposed to potential thunderstorms by being down in the gully. Sean decide to climb down since he was only wearing shorts, and got a head start on the descent while I put on my fancy $6 glissading pants. I caught up with him in hurry and was actually covering ground faster than Sean for the first and only time that day. It was a fun way to descend about 2000’ or so! We eventually made it down to the West Fork Pahsimeroi valley and were greeted with more fierce winds. They were strong enough that we saw a gust blow a handful of silver dollar sized rocks off a knob just a head of us. During the climb back up to the pass, it seemed like pretty slow going for me, but once at the saddle, it felt great to start heading down after gaining somewhere over 6500’ on the day. The descent was uneventful other than a few curses directed at the road we could have driven up. We capped off the day with deli sandwiches in Arco that were well worth the wait. This climb was an “instant classic” for me. I was very happy with the chance to bag a 12er in May, set a personal single-day gain record, and have the opportunity to climb with someone as experienced as Sean. Overview map of our route, up the west ridge then down the northeast gully. 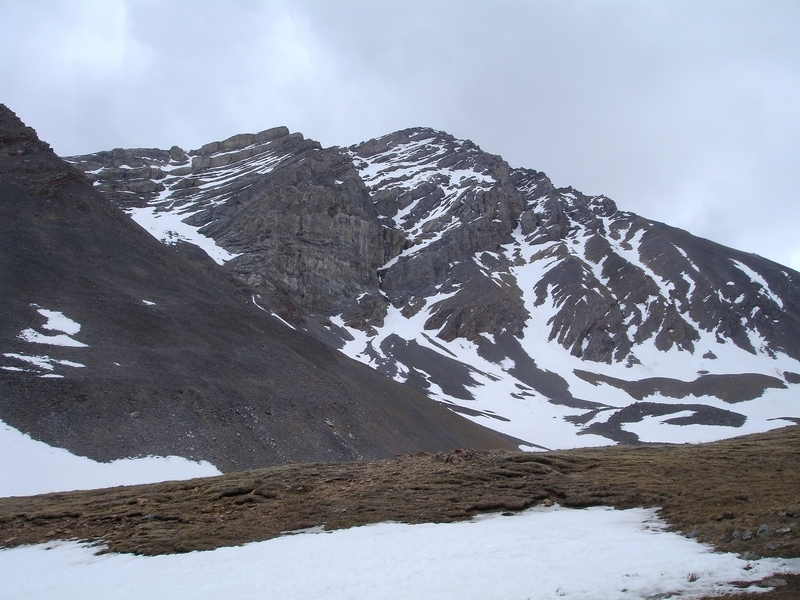 Southwest face of Leatherman from Sawmill Pass, around 9700'. 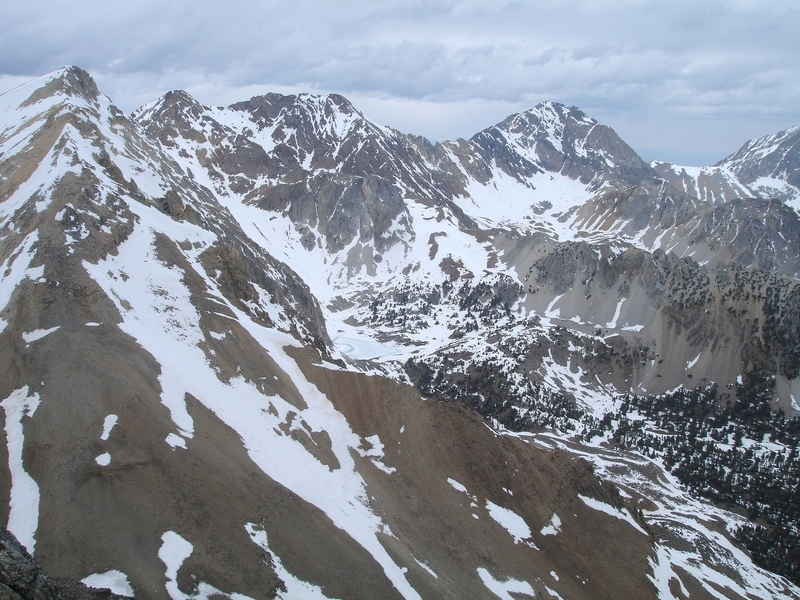 Leatherman Pass and the west ridge of Leatherman Peak. 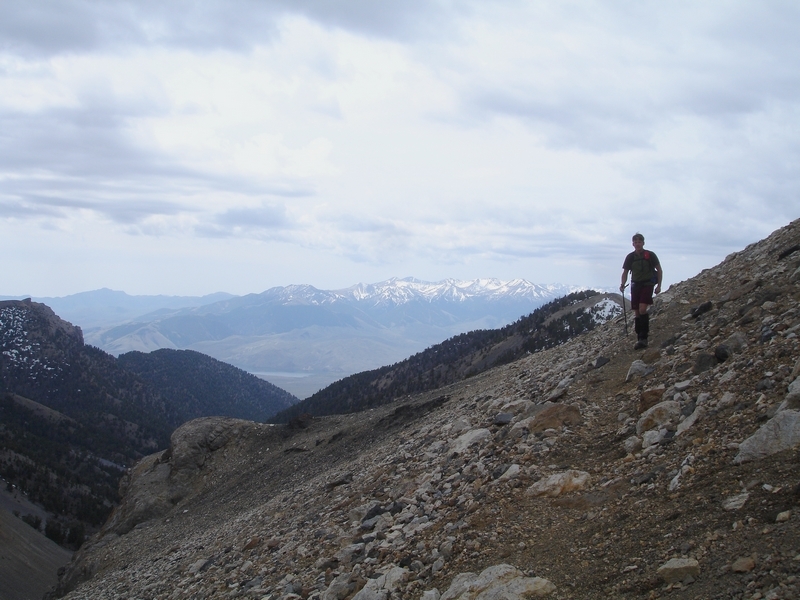 Sean on the trail to Leatherman Pass with the White Knob Mountains in the background. Looking up the west ridge. 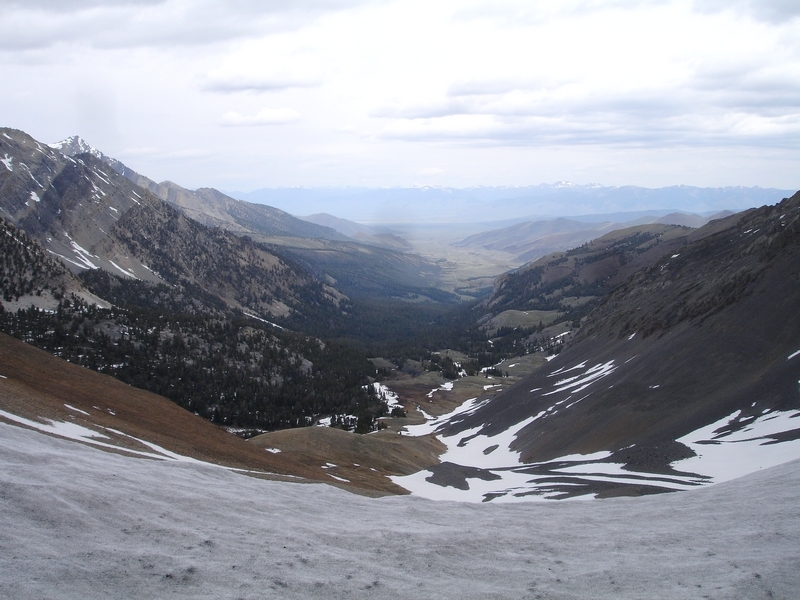 The West fork of the Pahsimeroi Valley from Leatherman Pass. Looking northwest from low on the ridge at Mount Idaho and Mount Borah. Sean beginning the climb up the west ridge. 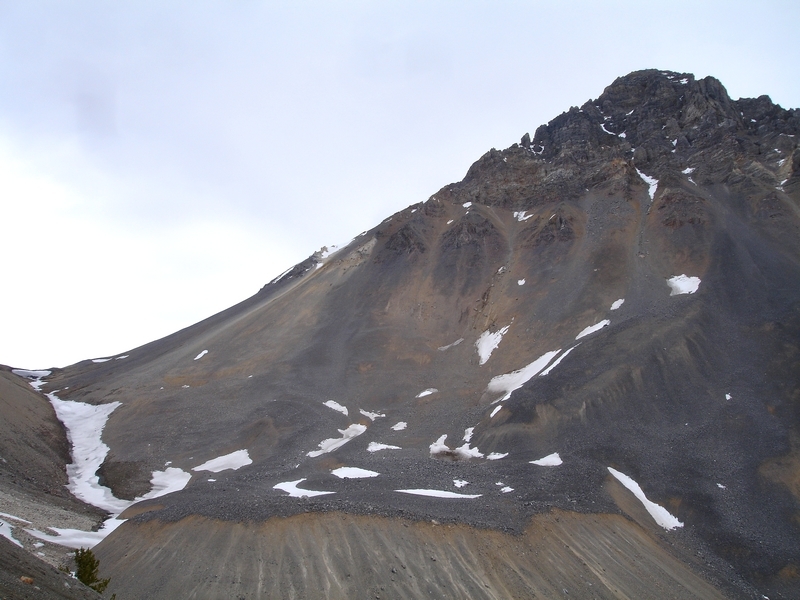 Mount Borah to the northwest. 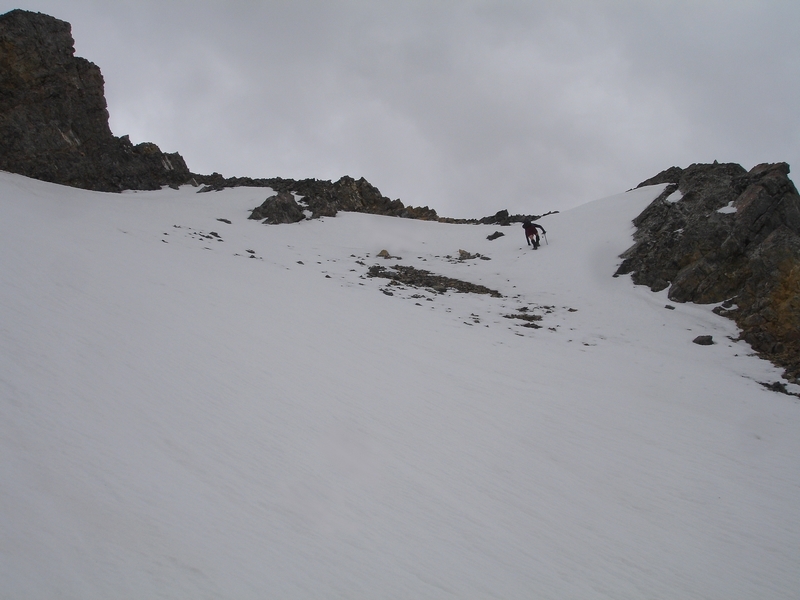 Sean climbing one of the last snowfields before the summit. Dave on the summit of Leatherman Peak. Sean checking out Mount Corruption. The view southeast from the summit. 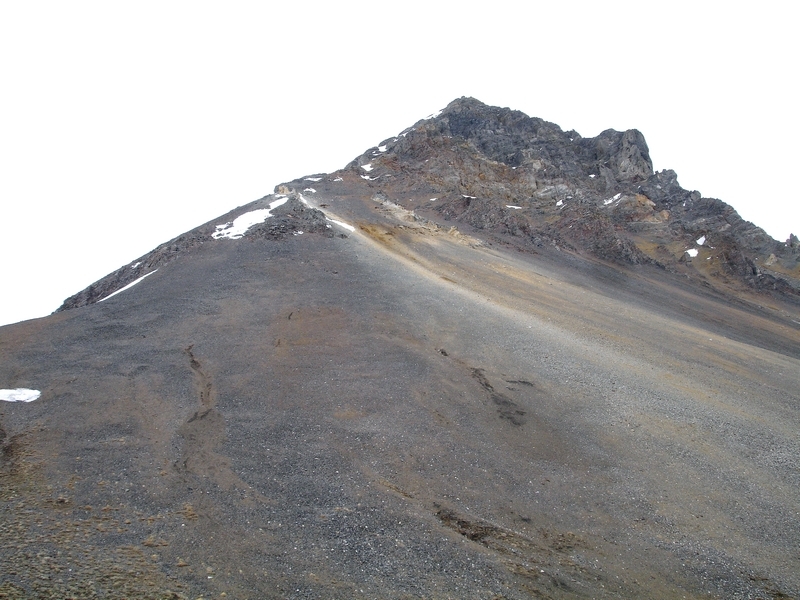 Looking back up the northeast ridge to the summit. The very cool rock layers of Badrock Peak, east of Leatherman. Looking down the north gully of Leatherman into the Pahsimeroi Valley. Sean is one of the specs on the snow far below. The soon to be green upper reaches of the Pahsimeroi. Leatherman Pass from the north. Looking up at the west ridge of Leatherman Peak from the northwest.